Hello there! It's Lisa Hoel with another guest post for you today. I am ready for fall weather around here. It is my favorite season! The leaves are starting to change color although it's still a bit on the warm side in my opinion. 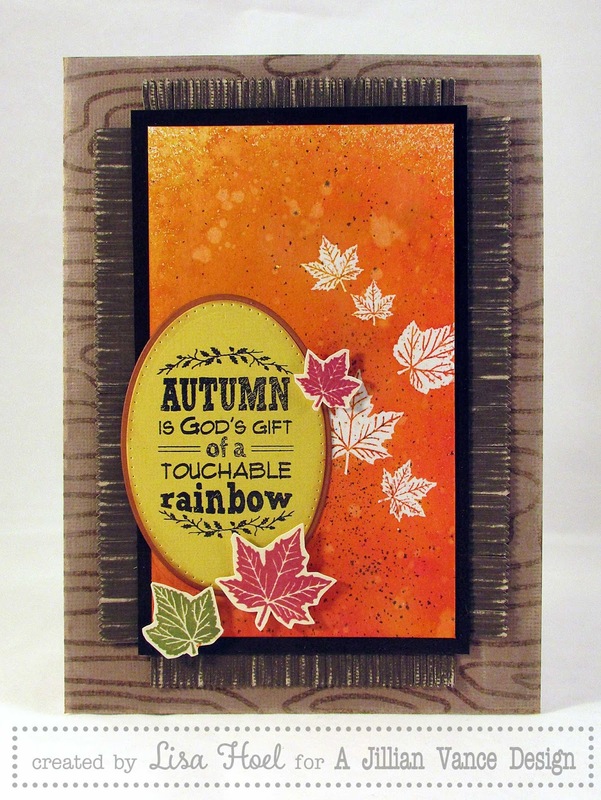 I was inspired to create a card with an autumn theme and the luscious colors that go with it. The center panel was created using the faux batik technique. I stamped and embossed the leaves with clear embossing powder onto the plain watercolor paper. The embossing powder acts as a mask. I then sprayed the paper with various colors of Distress Spray Stain and flicked it with plain water when it was dry. (The stain reacts with the water and creates the light spots.) You then remove the embossing powder by placing absorbent paper like plain newsprint or a coffee filter over the embossed area and ironing it. The powder melts and is wicked up by the paper. Quickly remove the paper before it cools and you will have people trying to figure out how you got the white images on your project. ;-) That's another oldie but goodie technique to have in your box of tricks. Thanks for stopping by and I hope that many autumn blessings come your way! Such a beautiful card! Love the colors and the texture!